Devonte Hart, his five siblings and their adoptive parents were in an SUV that went over a cliff in Northern California on March 26. His adoptive parents Jennifer and Sarah Hart, both 39, and four of the children— Markis Hart, 19, Jeremiah Hart, 14, Abigail Hart, 14, and Sierra Hart, 12 — have all been reported dead. 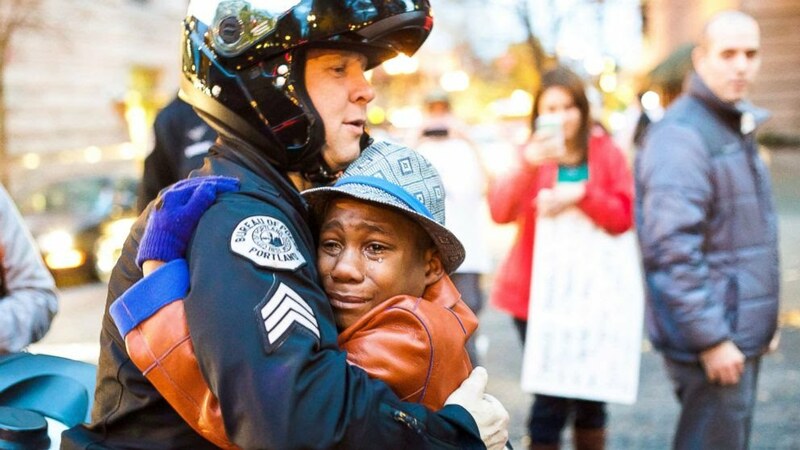 The bodies of 16-year old Hannah Hart and 15-year-old Devonte Hart, who is known for a viral photo in which he is hugging a police officer in November 2014, have been presumed to be dead. Nearly four months after the tragedy, the story has nearly disappeared from the headlines, but the Hart’s biological family is still speaking out. And they have harsh words for the system. Sherry Davis lost custody of her three children, Devonte, Jeremiah and Sierra, due to a cocaine addiction in 2006, NewsOne reported in April. The children were taken by Texas’ Department of Family and Protective Services and temporarily placed with their aunt, Priscilla Celestine. The children were taken away from the aunt in December 2006 — even though she had no criminal record, a steady job at a hospital, had raised her own daughter and moved to a bigger house to accommodate the children. However, the aunt lost custody because she let the children see their biological mother which was against court orders (Celestine was called in for work at the last minute and she let the children stay with their mother for a few hours). The kids were soon placed in the hands of their adoptive parents who abused and eventually killed them. Celestine, 67, and her attorney Shonda Jones spoke to The Washington Post. The last time that Celestine saw the children was in December of 2007, she said. “She spent two hours holding them and playing with them that day, she said in an interview, and cried when it was time to go,” Jones said. Sadly, there were countless reports of abuse from Jennifer and Sarah Hart, which date back to 2008. Despite a handful of 911 calls by neighbors, no one at Child Protective Services took sufficient action to save the lives of the children. How disturbing the system reacted so quickly to take the children away from their aunt—who was not abusing them—but did nothing with ten years of documented abuse.